You have cleared around your home. The long grass, overhanging branches, sprawling shrubs, scattered rubbish and pieces of timber have all been removed. There's one more fire hazard. If your roof and guttering have not been cleaned for a while they will have gathered various debris. Those leaves and twigs nesting in your gutter or sticking to your roof are pure tinder, waiting for a spark. 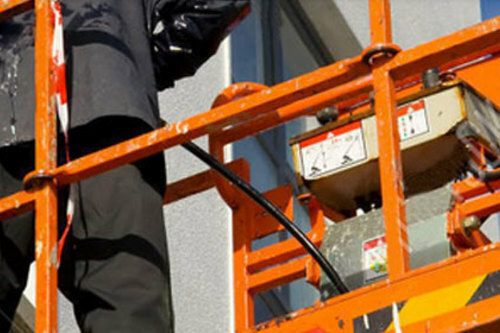 For safely pressure washing gutters, a gutter washing attachment is available. See the video above. Even if your house has a gutter guard, you need to check the gutters. Guards are very helpful, but they are not necessarily a complete and permanent solution and they need to be checked. Here are six safety precautions you can take, whether you're tackling the job yourself or acting as an assistant, or if you're just keeping an eye on proceedings while professionals complete the work. 1. In Australia, check first for gutter visitors such as snakes, spiders, rodents, ants, wasps and the occasional cane toad. If waste matter obscures your view of who or what is lurking there, run a long brush-handle or any long stick through the gutter before you begin cleaning it out. 2. Wear work gloves, and preferably rubber soled footwear that will help you to keep your grip on the ladder and to stay steady on the roof. Use protective eye-ware. 3. For the roof, if you have to D.I.Y then have a mate within cooee. If you have to go up there, secure your ladder first. 4. Roof cleaning will probably need a soft wash (500 - 1,000 psi), not a high pressure power wash which can cause damage. 5. 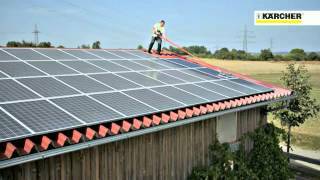 Also for the roof, try to get the job done before the hottest days arrive. If it is too late for that, schedule it for early morning or late evening. Trying to walk over a metal roof during mid-day hours in summer heat is not unlike stepping onto a hot BBQ plate. 6. Keep an eye on the weather. 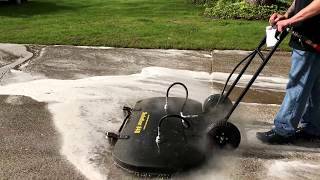 Light rain need not be a deterrent for pressure washing, but extra care is required if any surface is slippery before you begin. 7. Be aware of power lines, phone lines, aerials and any electrical wiring at all times while you are cleaning gutters or roofs. If ever you stumble over an unsecured or damaged electric cord or cable, contact a licensed electrician immediately. 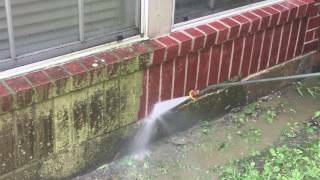 To pressure wash an older brick home safely, a small amount of preparation can be very helpful. 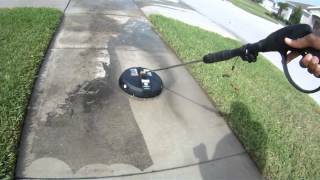 A pressure washer can help with removing stains from a concrete driveway and restoring its condition and appearance. 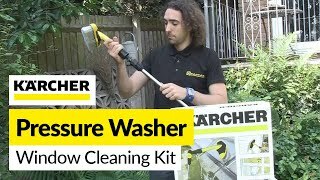 These pressure washer attachments are particularly helpful. 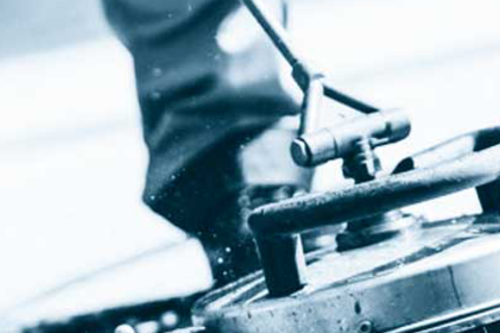 They save you time and effort, increase safety, and reduce stress during the task. If the surfaces of solar panels become scratched this affects their ability to generate power. How to clean them safely? 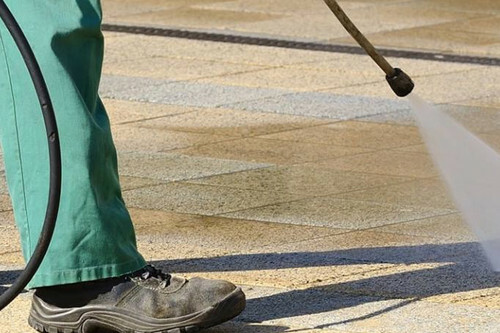 Pressure washing a sandstone building with too strong a force may cause damage, particularly if the sandstone is inadequately sealed. 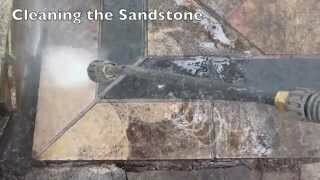 Pressure washing sandstone pavers is a simple and rapid way of cleaning them, with brilliant results. For cleaning most roofs, use a soft wash. 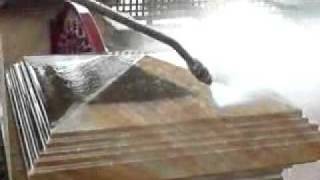 Within that context, different roofing materials require different cleaning methods. 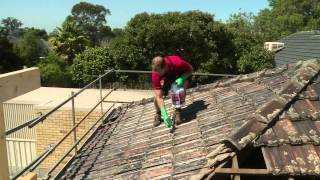 Pressure Washing Your Roof - DIY or Professionals? 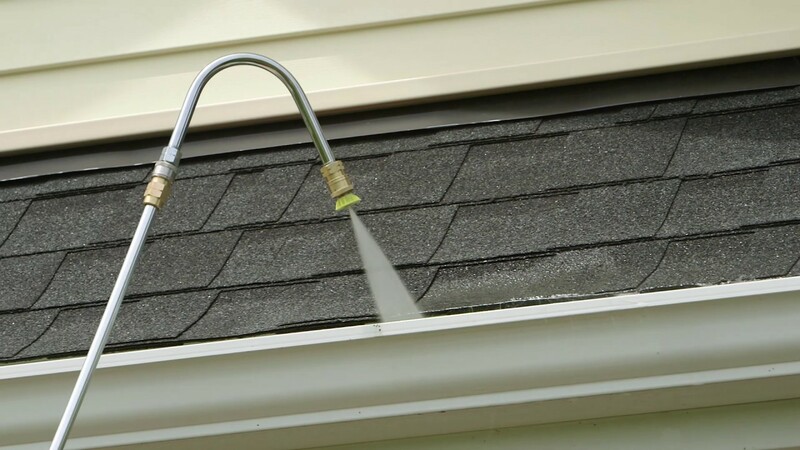 Should you pressure wash your own roof? Or call in your local professional roof cleaning team? 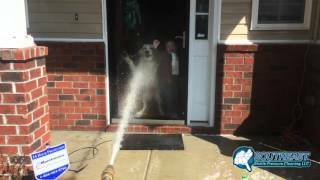 Keep pets and small children at a safe distance while you are pressure washing.